MV-22 Osprey vertical take-off and landing transport aircraft that are to be deployed to Futenma Air Station. This photograph was taken in July 2005 at a base on the east coast of the United States. On May 13, the Ministry of Defense submitted a report put together by the U.S. Marine Corps entitled, “Final Environmental Review for Basing the MV-22 aircraft at Marine Corps Air Station (MCAS) Futenma and Operating in Japan,” to the Okinawa Prefectural Government, Ginowan Municipal Office and Urasoe Municipal Office. In the review, the U.S. Marine Corps concluded that basing the MV-22 at MCAS Futenma and operating it from there would not result in any significant harm to the environment. However, data indicates that the environmental burden on Okinawa will increase due to the number of annual operations planned for the MV-22 Osprey vertical take-off and landing transport aircraft at the Ie Shima Training Facility (ISTF). The Marine Corps will increase the number of operations for the Osprey aircraft to more than 2.3 times that of the CH-46 transport helicopter. 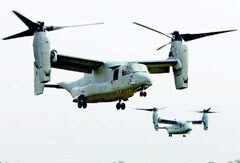 Training for the Osprey may be held as many as 6760 times a year, compared to the 2880 times for the CH-46 during 2010. The MV-22 has recorded a mishap rate of 1.12 per 100000 flying hours, which is lower than the 2.47 for the average for all aircraft of the U.S. Marine Corps, but this data does not include the crash that occurred in April this year in Morocco. The review specifically states that the U.S. Marine Corps will operate the Osprey in the Central Training Area (CTA), the Northern Training Area (NTA), Camp Hansen, Camp Schwab, and from Kadena Air Base, implying that they will operate the aircraft throughout Okinawa. The Marine Corps has suggested that increased use of sophisticated simulators will reduce the overall operations for the MV-22 at Futenma Air Station by 11% annually. However, the number of operations will increase to 280 times per day, which is 3.7 times the frequency of the CH-46 operations, which averaged 76 times per day, both during the night and early morning (10:00pm-7:00am next day). At the ISTF, the MV-22 squadrons will carry out Field Carrier Landing Practice (FCLP), simulating an aircraft carrier “deck” at the ISTF complex, as is currently carried out by the CH-46 squadrons. The MV-22 squadrons will carry out about 2500 FCLP, which represents 37% of all FCLP annual operations over Iejima. In addition, the squadrons will implement a Terrain Flight (TERF) route along which the CH-46 currently flies at low-altitudes (50 to 200 feet above ground level) at the NTA. The Marine Corps suggests that Confined Area Landings (CAL) training at the existing landing zones would decrease overall by about 12% from current levels, with a decrease in the use of landing zones in the NTA and CTA and an increase in operations for the ISTF complex. The squadron will operate at the newly constructed landing zone within the NTA near Takae, in the Higashi area. The MV-22 squadrons will fly over Kadena Air Base 1200 times annually in order to carry out ammunition supply. With regard to the environmental impact of the MV-22 squadrons, the Marine Corps has pointed out that in the NTA there would potentially be impact on the karasu-bato, or Japanese wood pigeon, and the Yambaru-kuina, or Okinawa Rail, which is a protected species. The Marine Corps said that from 2003 through 2011, the MV-22 recorded a mishap rate of 1.12 per 100000 flying hours, which was lower than the Corps average, but this did not include the crash in Morocco. The mishap rate for the aircraft submitted by the Ministry of Defense was 1.93, which included the crash in Morocco. In the review, with regard to low-frequency noise from the operation of the aircraft, the Marine Corps quoted data from the alternative facility construction plan for the relocation of Futenma Air Station to Henoko, Nago, without carrying out any research by itself. The matter of low-frequency noise emitted by the aircraft is a controversial issue in Okinawa. In the review, the Marine Corps has not provided data covering the Henoko in Nago, the location where the alternative base for Futenma Air Station is due to be constructed. MV-22 squadrons will fly to and from Camp Fuji in Shizuoka Prefecture and Iwakuni Air Station in Yamaguchi Prefecture.